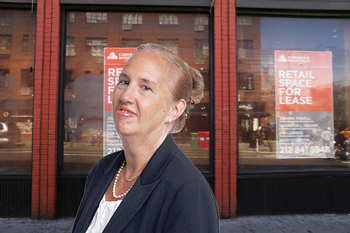 Nearly 200 storefronts on Broadway are sitting vacant, a recent survey released by Manhattan Borough President Gale Brewer shows. The survey, run by volunteers and interns, was commissioned to provide the city with a clear view of the extent of commercial vacancies. The survey found almost 60 percent of the vacancies are below 110th Street, according to the Wall Street Journal. Broadway stretches 13 miles from the Financial District to Inwood. “The normal ‘invisible hand’ of capitalism — old businesses closing and new ones quickly replacing them — too often doesn’t seem to work in Manhattan,” Brewer said in a statement. “Almost every neighborhood seems to have a storefront that’s been vacant for years.” She added there’s a need for new policies to encourage occupancy.